"The Party Disco For Your Special Event"
Mobile disco for your special event, weddings, birthdays and anniversary's, children's parties, staff parties. Themed nights such as 70's and 80's. All music accross the decades together with the latest chart. Professional light show and sound system. 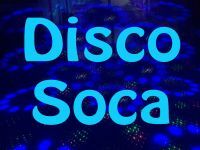 Required by many venues, Disco Soca has a current PLI policy with National Association of Disc Jockeys in the amount of £10 million. Also required by many venues, Disco Soca has supplied satisfactory evidence of holding current PAT inspections of their equipment dated within the last 12 months. A Method Statement, outlining Disco Soca&apos;s Health & Safety procedure for setting up disco equipment has not been supplied. Why do people choose to book Disco Soca? He met what we wanted for a DJ and was affordable. Within budget and prompt reply. Good lighting. "Very happy with the service Nigel delivered, I would 100% recommend him "
"Nigel was excellent I would recommend him to anyone and would gladly have him do a disco for us again, so glad to have found him. Thankyou !!" "Nigel was very friendly and considerate in regards to the guests and their potential music taste. He played more chilled music to begin with whilst the guests were conversing, before following requests and instruction from myself and a few others to change the music to more upbeat for those who wanted a dance. " "Our guests said they had 'the best night ever'! Nigel brought some UV lights as well to go with our theme - useful for photographing the girls with their UV face paints on! He rounded off the evening with 'the hokey-kokey' putting the birthday girls in the middle - this went down really well and got parents collecting their girls involved too. All in all a great service - Thanks Nigel!" "Nigel did what was asked of him on the day with no fuss and played to the audience. We will defiantly book him again for other events." "Our dj was fantastic, great interaction, great music and great fun games, would definitely recommend Nigel to friends, fantastic job, Thankyou "
"I would defiantly recommend Disco Soca. Nigel played all the music we requested which suited all different ages. My family and friends all complimented how great the music was and everyone was up dancing all night. Thank you Nigel"
"Really impressed with great feedback from the many guests. thanks Nigel!" "A very good disco, great value , exactly what we wanted and asked for, nigel was brilliant and friendly, would definitely recommend him and will definitely use him for future party's (if he is available) huge thank you to nigel for doing our disco:) "
"Nigel from Disco Soca provided a great disco for our daughter's 21st birthday party. Music played in the evening and into the night went down really well with party goers of all ages. Thank you very much." If you are contacting Disco Soca about an event, it's always a good idea to include the DATE, LOCATION, EVENT TYPE, AGE GROUP and TIMINGS to speed things up!